Penguins, penguins! | So Many Exciting and Beautiful Places! ← Falkland Islands or Islas Malvinas? 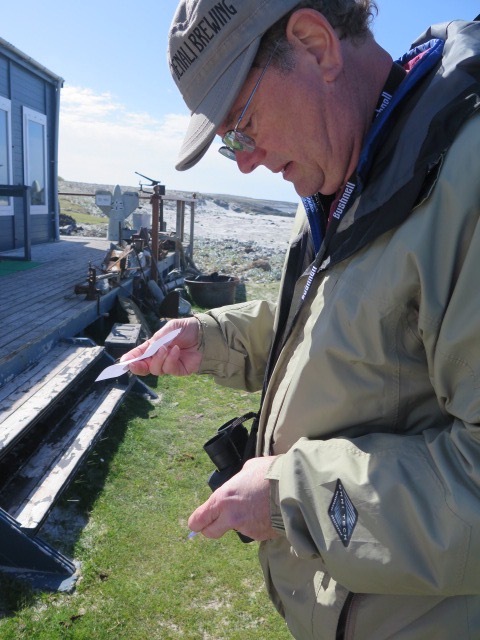 After arriving early this morning at Port Stanley in the Falklands, we tendered to shore for an excursion to Bluff Cove Lagoon, a family farm owned by Hattie and Kevin Kilmartin. It can be a difficult tender ride to shore, anywhere from 25 – 45 minutes depending on the weather. Today, the weather was in our favor, with partly sunny skies and calm seas. We were told that there was rain and strong wind yesterday, and had we arrived then, we wouldn’t have been able to go to shore. 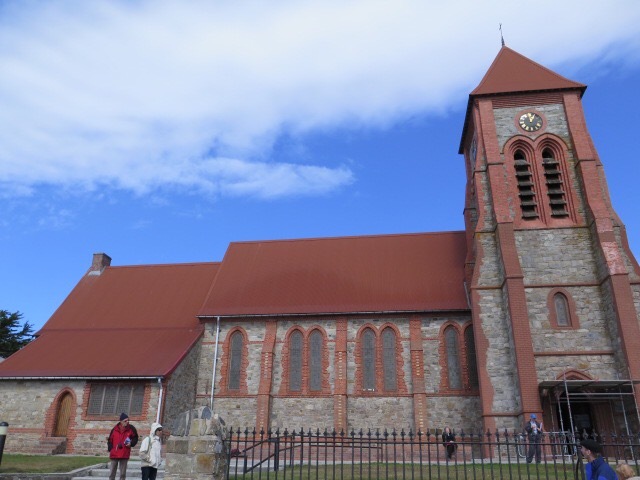 Stanley is the only town in the Falklands. There are about 2,200 people who live year round in Stanley, with another 600 plus outside of the town. In addition, there are about 2,000 military and contract personnel on the islands. Most of the land outside of town, aside from the military base, is farm land. There don’t appear to be many crops grown here, except for use as animal feed, but there are over one million sheep and about 5,000 cattle. Fruits and vegetables have to be imported. 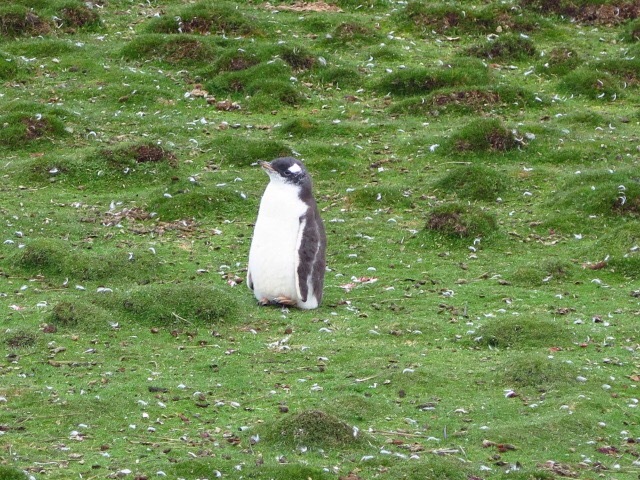 But we were here to see penguins, not cows and sheep, so we boarded a van for a short ride out of Fort Stanley, on Darwin Road, which was built in 1985 after the Falkland War. Prior to the war, there were no roads outside of Stanley, but the British beefed up their operations there, building an airforce base and this road to get there. We passed a “shoe shrine” on what is known locally as Boot Hill. Nobody knows for sure how or why it exists, although our guide believes that the military personnel and families keep it up to date. We then got on a Land Rover for a cross country trek to the farm. 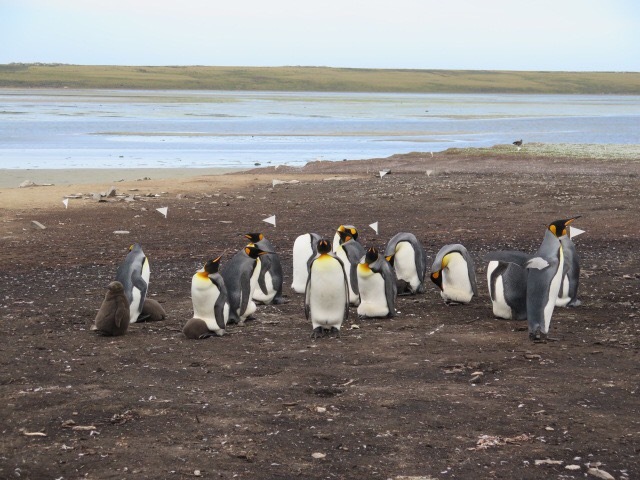 We were richly rewarded, with a small colony of King Penguins and a few of their young, plus a much larger colony of Gentoo Penguins. The King chicks were still brown and very fuzzy looking. 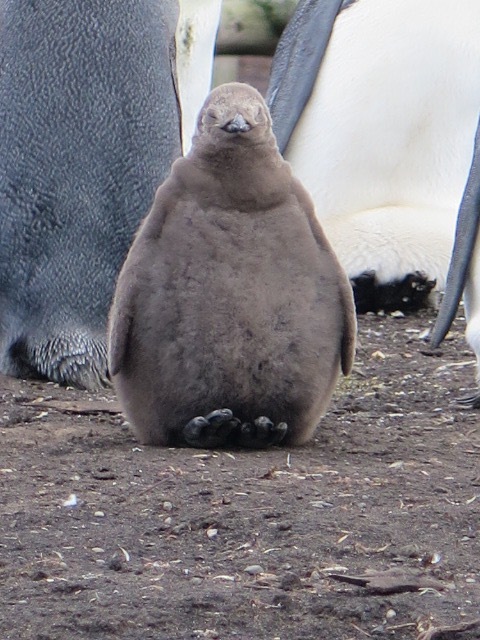 The Gentoos breed earlier in the year, so their chicks are mostly full-grown, but still somewhat downy. 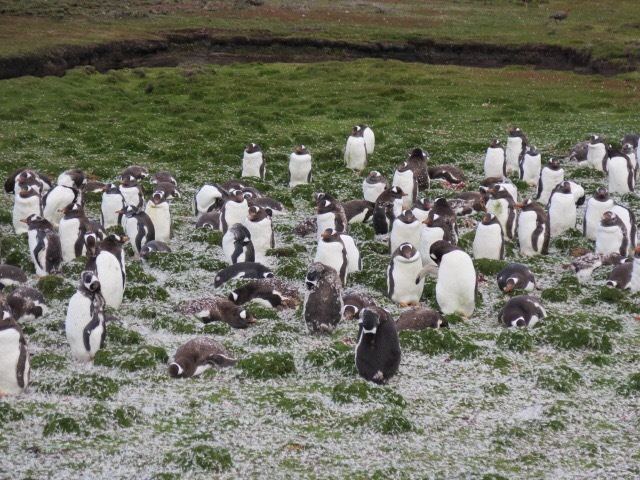 The ground around them was covered with down that the chicks have been shedding. Did you know that there was an annular eclipse today, at least in this part of the world? We didn’t know ahead of time, so didn’t bring the proper eyewear to observe the eclipse. 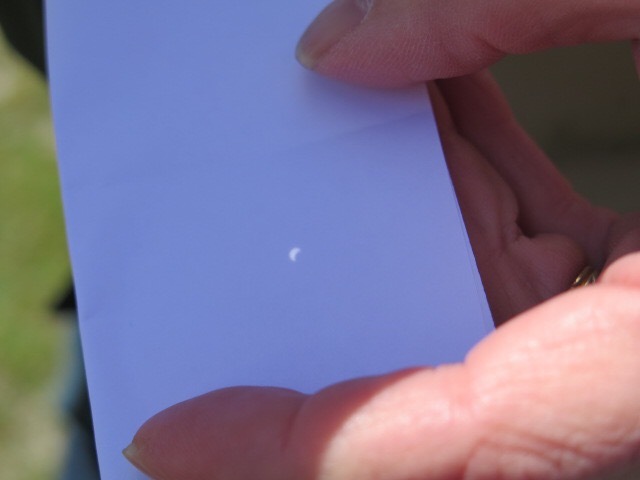 Mark is very resourceful, and he created a pinhole projector so we could see it vicariously. He’s so clever! 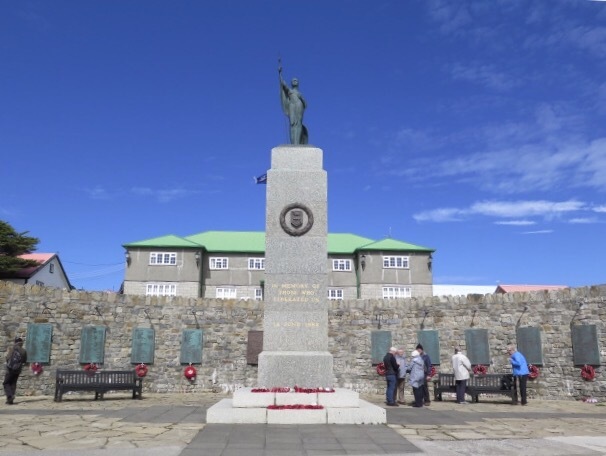 We spent a little time in the lovely downtown area, visiting the Falklands War Memorial as well as a few shops. We walked by both the Catholic and the Anglican churches, and couldn’t help but notice that, as usual, the Anglicans appear to have more money. 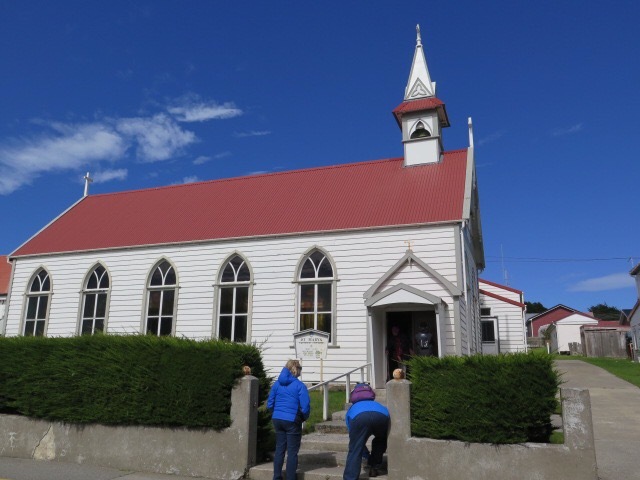 Fishing (especially squid) is the biggest industry in the Falklands, with sufficient revenue from commercial fishing licenses to provide health care to all of the residents, and cover university education in England for every student who can pass the exams to qualify. Most of the students do return to the Falklands after completing their education. Tourism is the second largest industry, and sheep farming is probably third. Temperatures in the winter range from 40 – 54 degrees in winter, and 50 – 61 degrees in summer. The temperatures are modulated by the ocean year round. The Falklands can, however, experience gale force winds, as was the case yesterday. 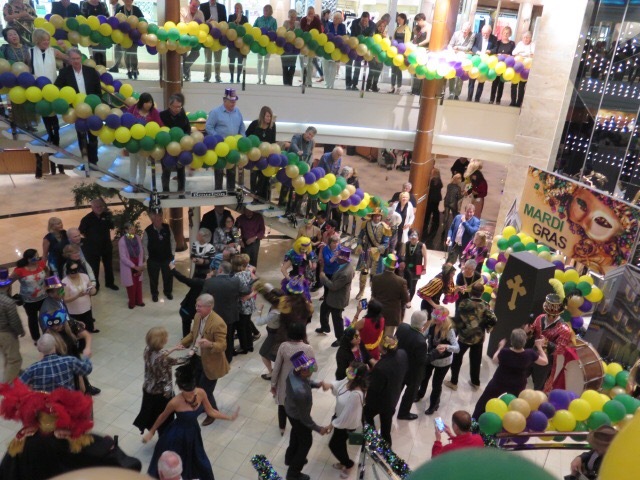 There was an early Mardi Gras celebration on board the ship tonight, with great Dixie Land music and dancing. 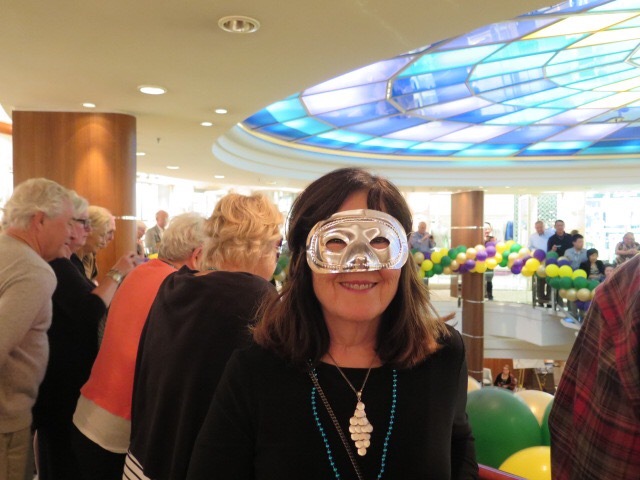 This entry was posted in Crystal Cruises, Falkland Islands, Penguins, South America Travel, Uncategorized and tagged Falklands War, Mardi Gras. Bookmark the permalink. 2 Responses to Penguins, penguins! This combination of photos shows an annular solar eclipse as seen near Sarmiento, Chubut, Argentina, on Sunday. Stargazers applauded as they were plunged into darkness when the moon passed in front of the sun in a âring of fireâ eclipse. We were actually south of the path of greatest effect, so we didn’t notice much of a change in the light.